That banner with the photo of China’s president Xi Jinping, again benevolently smiling, fits in quite nicely with the rest. An untrained eye, or a blurry one at 05:30am, wouldn’t right away notice anything off. Even a harder core reader of the Times could have trouble seeing that banner for what it is. My first thought was this was another part in the impressive series of China features that the NYT has been running this month. Those are different, more graphical, in lay-out from other, regular online content as well. But this banner links to paid content. Advertising. Clicking it gets you to an article written by China Daily, an English language newspaper controlled by the Chinese state. Being a state controlled news organization, China Daily only publishes stuff not critical of China or its leaders. Rather: it praises them in any way possible. So when China is under attack at the United Nations for locking up Uyghurs in prison like facilities to undergo forced re-eduction, for example, China Daily will report that ‘China's human rights achievements received positive international feedback’. 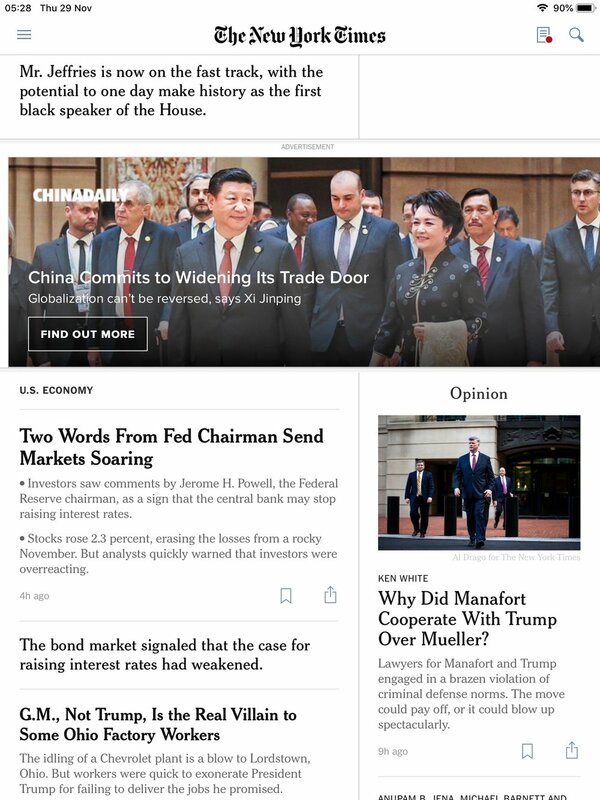 The paid story China Daily is now pushing in the New York Times is even hosted on the site of the Times. The New York Times logo is on top of the page. I don’t feel the ‘Advertisement’ grey banner is sufficient considering everything else. The China Daily’s NYT story covers a Xi Jinping speech at the China International Import Expo, a major trade show held early November in Shanghai. I really don’t think the label ‘T Brand’ (whatever that is) sitting on top of the headline makes it clear we’re dealing with content written under Chinese government control. It is an almost perfect stealth move by the Chinese propaganda machine, inserting its content into the New York Times like this. Almost. If only they’d acted a bit faster. Xi Jinping held the speech their story covers on 5 November. Three weeks ago. That’s when the NYT’s own journalists published this piece on it.